Greetings everyone! 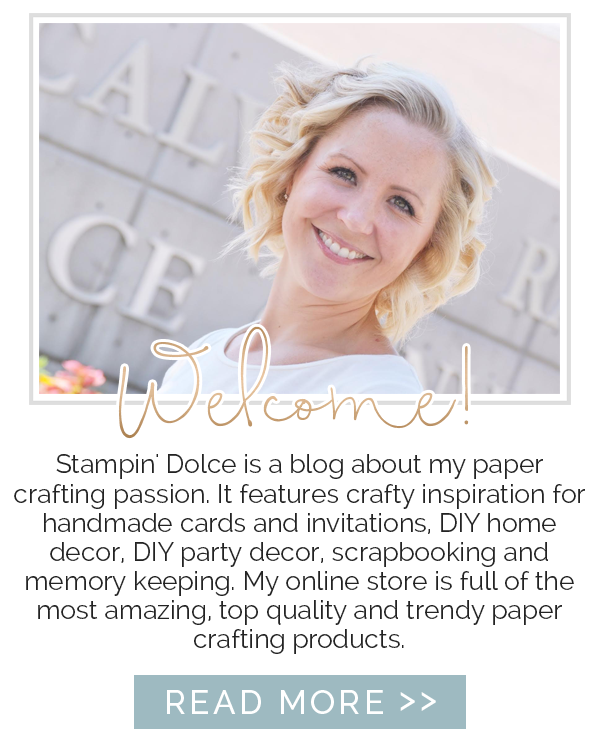 Today I am blogging for the Stampin' Up! Artisan Design Team. The team is comprised of 20 talented designers from around the world. 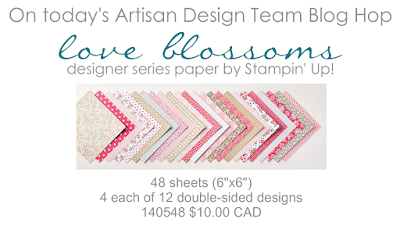 Our assignment this month was to create using the Love Blossoms Designer Series Paper stack. 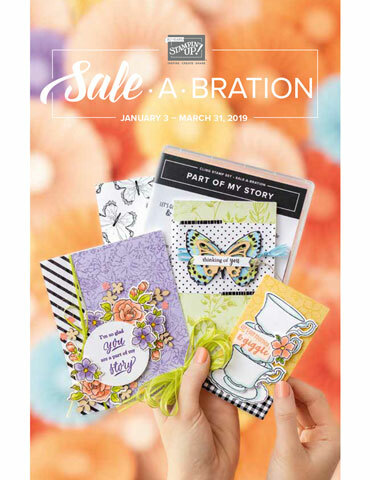 If you do not love this paper already, I am sure you will by the time you are finished this blog hop! I was inspired to design this card with my Grandma in mind. She has been deteriorating in health over the last few months and was moved to extended care just before Christmas. She has Parkinson's Disease and Dementia. When we were moving her out of her assisted living condo recently we had the sad and very difficult task of sorting out all of her Old Country Rose china. 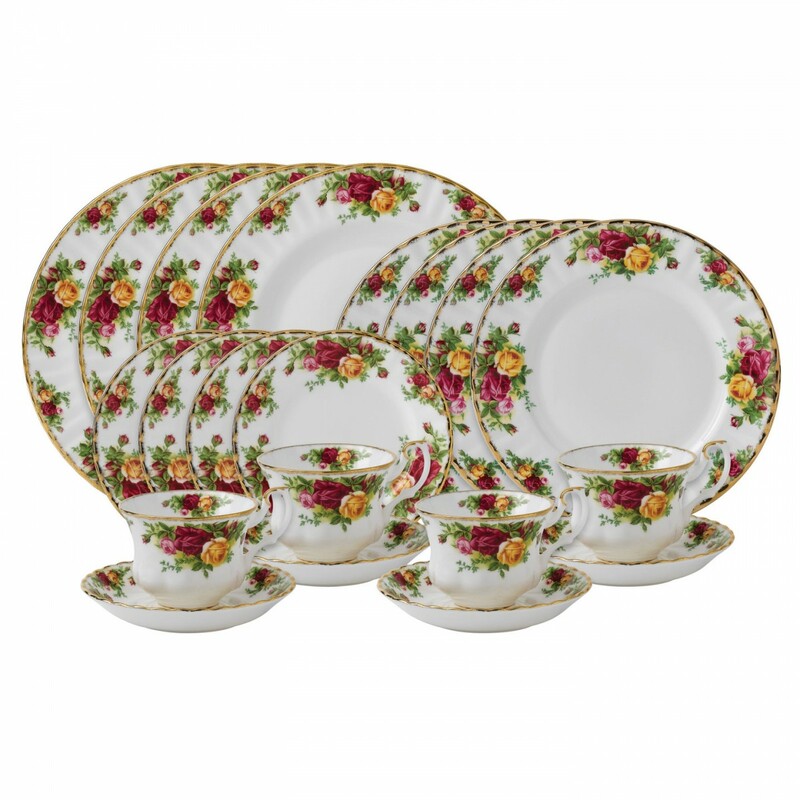 She had a passion for the china and had every possible piece ever made, I am sure. The dishes, of course, are staying in the family. It was the vases, the clock, phone, jars, coffee pot, candy dishes, night lights and more ... that needed to find new homes. I took a few pieces that reminded me of her. And with all of that this card was born! Wash your watercolor paper with the Aqua Painter. (Cover the entire surface with a light coat of water). Do not allow to dry before you start stamping. 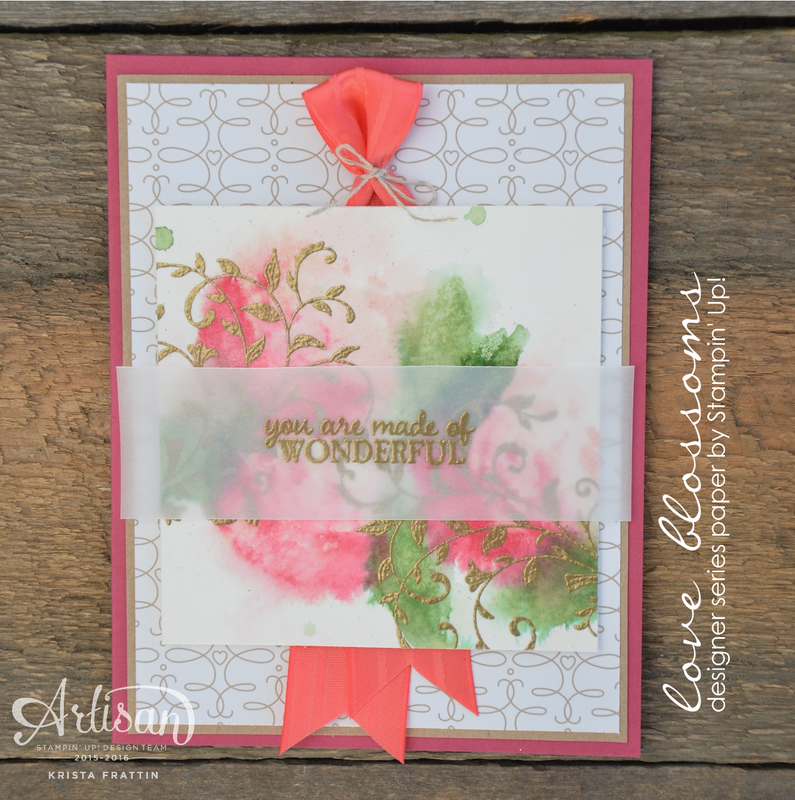 Stamp your fullest flower using Blushing Bride ink. Stamp the second fullest flower using Rose Red ink. Again, it will run and bleed. Use a Kleenex as required. Old Olive, then the least fullest leaf in Garden Green. Dry completely with a heat tool. Here is a quick picture of Grandma Rita and I at Christmas! 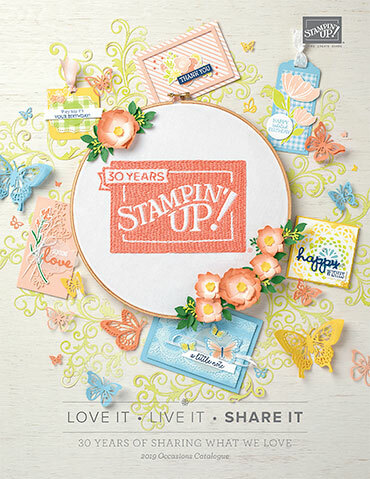 These projects will also be featured on the Stampin' Up! Corporate Facebook Page this week. 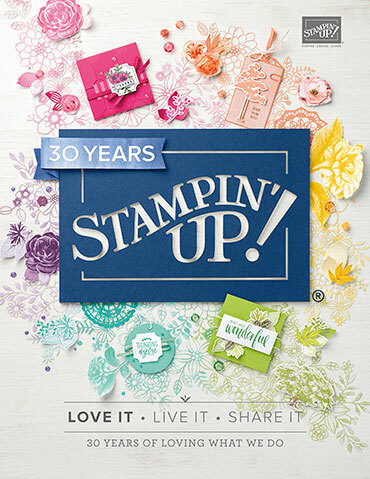 Be sure to find Stampin' Up! on Facebook to like and share! 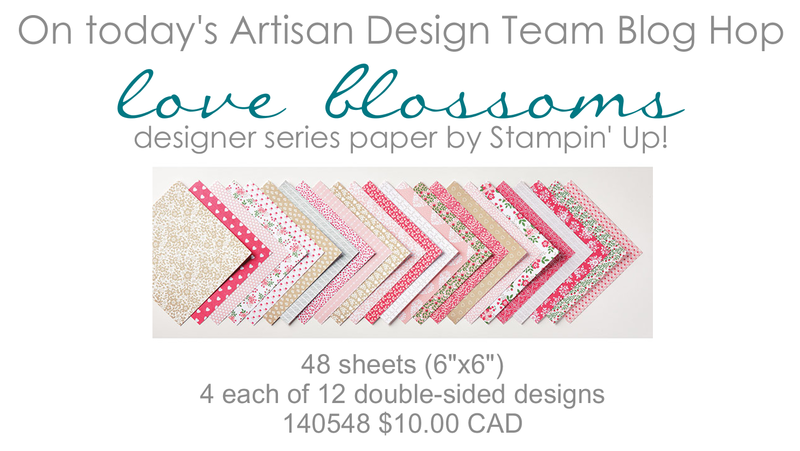 she has created with the Love Blossoms paper! The Artisan Design Team will be back February 4th with another exciting Blog Hop! Be sure to come back and visit! Have a creative day!